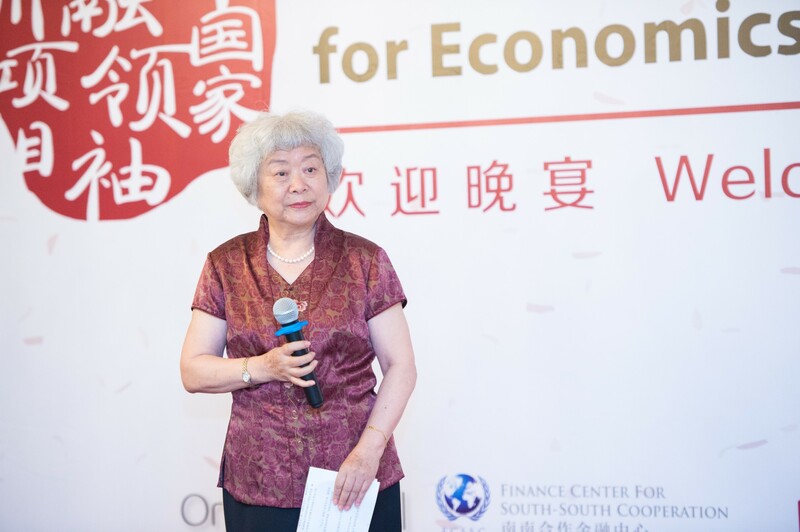 In early summer of 2017, as co-organized again by the Finance Center for South-South Cooperation (FCSSC) and the Tsinghua PBC School of Finance (PBCSF), the second “South-South Education Program of Economics and Finance” was successfully launched in Beijing. This year, sponsored by the South South Education Foundation (SSEF), the Hongru Financial Education Foundation and China Taihe Group, the “South-South Education Program of Economics and Finance” attracted senior financial officials, bank executives and influential enterprises’ CEOs from 24 developing countries in Asia, Africa, America and Europe to fully participate in the one-week program from June 26 to July 2. 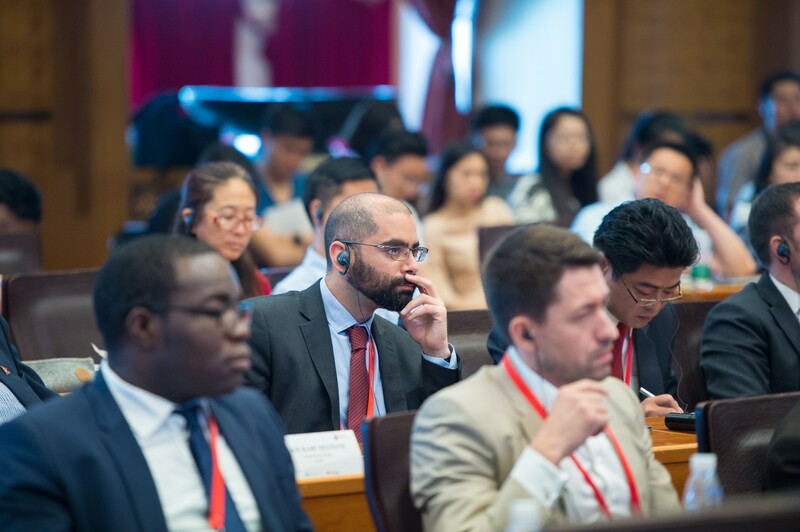 These official from the global South came to China to pursue an in-depth study of China’s economic and financial development, learn from China’s experience and exchange ideas with China’s financial elites face to face. Under the framework of South-South cooperation and “Belt-and-Road”, the Program aims to promote common development by building the bridge for financial exchange and cooperation not only between China and other South-South countries, but also among countries along the “Belt-and-Road”. “China has made great economic achievements. I came here to learn from your development experience, especially in the financial market,” said Mr. Ram Hari Neupane, Director of Legal Division of Nepal Rastra Bank (Central Bank of Nepal). The Program managed to invite many star teachers to give lessons to these financial leaders from developing countries. Teachers included Dr. Jiao Jinpu, Chairman of Shanghai Gold Exchange and former Director-General of the Financial Consumer Protection Department of the People’s Bank of China, Dr. Huang Guobo, Chief Investment Officer of CNIC Corporation Ltd., Prof. Zhang Yansheng, Director of the Foreign Economic Research Institute of the National Development and Reform Commission, Prof. Luo Ping, former senior supervisor at China Banking Regulatory Commission, Prof. Liao Li, Executive Associate Dean of PBCSF, Dr. Qi Bin, Executive Vice President of China Investment Corporation, Prof. Jin Canrong from Renmin University and Prof. Peng Kaiping from Tsinghua University. 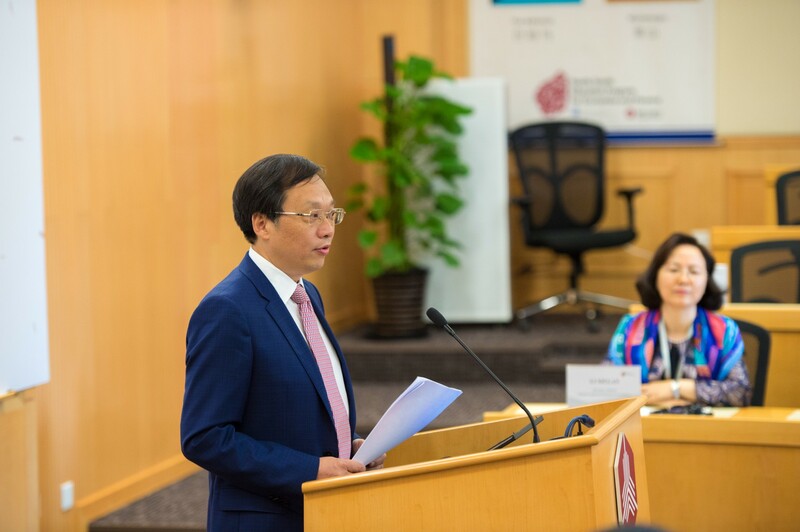 In addition, Mr. Cai E’sheng, Chairman of FCSSC and SSEF, also former Vice Chairman of China Banking Regulatory Commission, particularly spent half a day teaching and offering Q&A opportunities for program participants. 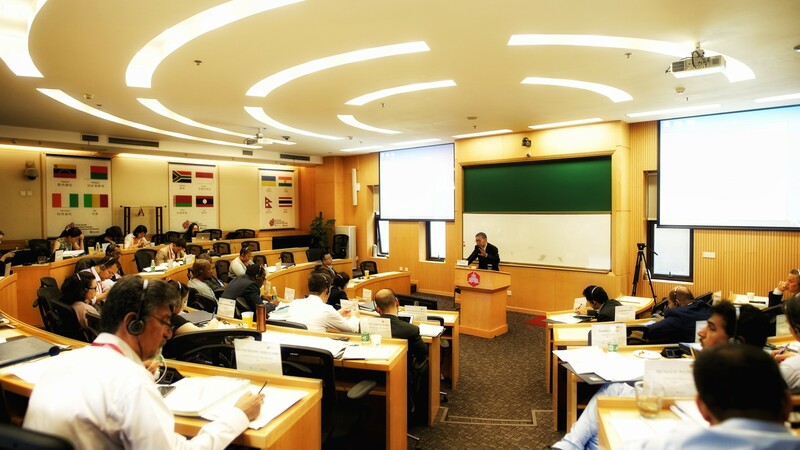 The class talked about the reform and development of China’s banking industry, the interest rate policy of the Central Bank, the exchange rate risk in developing countries, as well as hot financial topics like the regulation of new financial instruments in the era of internet finance. Chairman Cai said that the consensus of the future world was not only to end poverty in the global South, but also to achieve the goal of common development, which was echoed by General-Secretary Xi Jinping’s vision in 2015 to build the globe into a “common community of human destiny”. 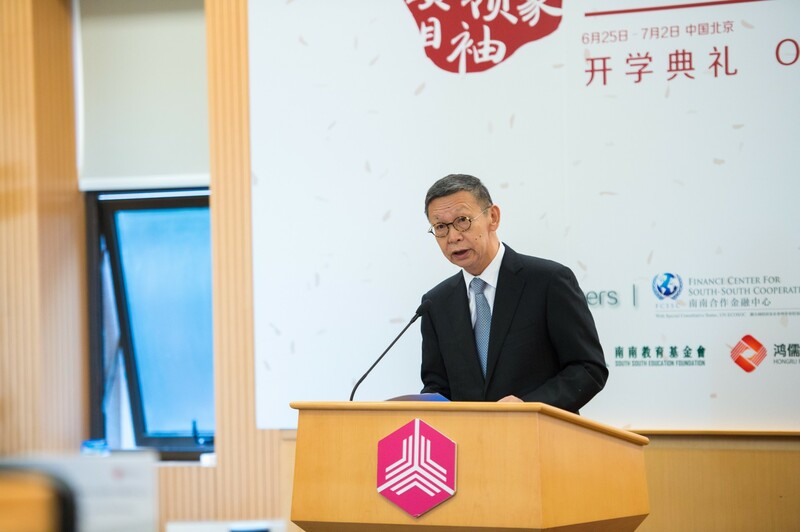 “To achieve that goal, we need to solve the problem of different development capabilities of each country based on its national development practice and conditions, and therefore find the unique development path in compliance with the market law and the international rules, rather than simply copy other countries' development experience,” said Chairman Cai. During the 7-day study session, apart from traditional classroom learning, the organizers also guided program participants to company tours so that they could go to the frontline of China’s financial reform and development in person. The first stop outside the classroom was Asian Infrastructure Investment Bank (AIIB). Sitting in the boardroom of AIIB headquarter, the program participants listened carefully to the presentation by AIIB’s senior policy strategist Mr. Uwe Wixforth and the Manager of AIIB Investment Operations Department Mr. Fang Ke, with the focus on the principles, policies and procedures of AIIB investment projects, as well as the background and mission of AIIB. During the discussion, these financial officials from developing countries didn’t forget to look for Chinese investors. Ms. Sorraya Phiboonkulsumrit, Advisor to Vice Minister of Finance in Thailand, said that her country should try hard to get investment from China to construct the China-Thai Railway as soon as possible and be connected to the “Belt-and-Road”. 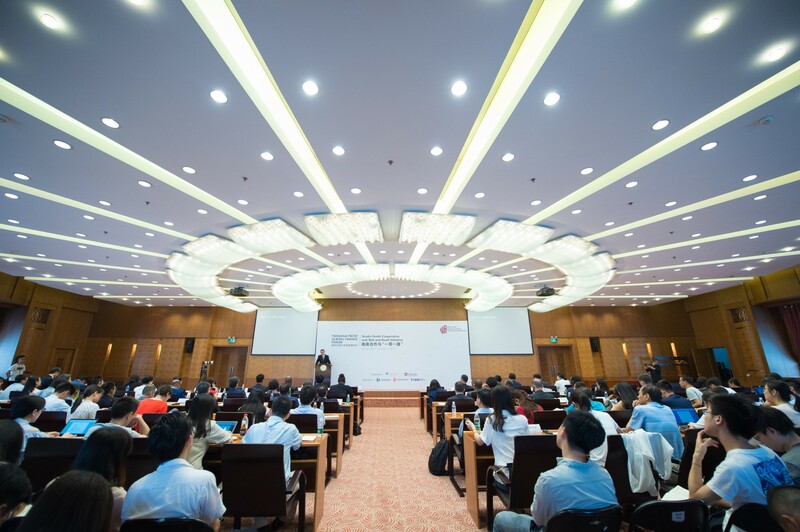 In the Memorial Hall of China Development Bank (CDB), the program participants stayed for a while to listen to the lecture given by Mr. Hu Dongsheng and Ms. Huang Minhui, Deputy Director of CDB Planning Department and Deputy Director of CDB Training Department respectively, regarding the “Belt-and-Road” Initiative and CDB’s main functions. In the eyes of Dr. Roger Madrigal Lopez, Chief Economist of the Central Bank of Costa Rica, although it was the first time to visit China, he finally witnessed the success of China’s reform and open-up policy. He believed that the “Belt-and-Road” Initiative would create great space and potential for the global South, and with China’s capital reaching every corner of the world, RMB internationalization would become a matter of course as a result of the increase of trade interactions between China and the rest. 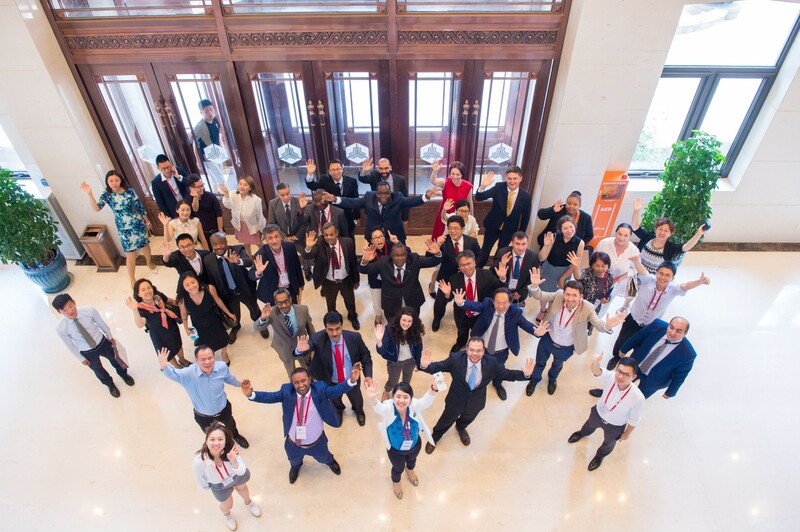 A bright picture was taken in the headquarter of the Silk Road Fund, with people in different skin colors and different English accents smiling briskly. The spirit of ancient silk road, “openness, inclusiveness and win-win”, has been inherited and carried forward by South-South countries. As Prof. Liao Li mentioned in the program opening ceremony, that “developing countries face a lot of difficulties in the process of further development, in which the most urgent are debt and short of funds, but the current international economic environment and financial system cannot tackle the two dilemmas”. In response to that, the Silk Road Fund was founded in 2014 to provide financing support for economic and trade cooperation, bilateral and multilateral interconnections within the “Belt-and-Road” framework. 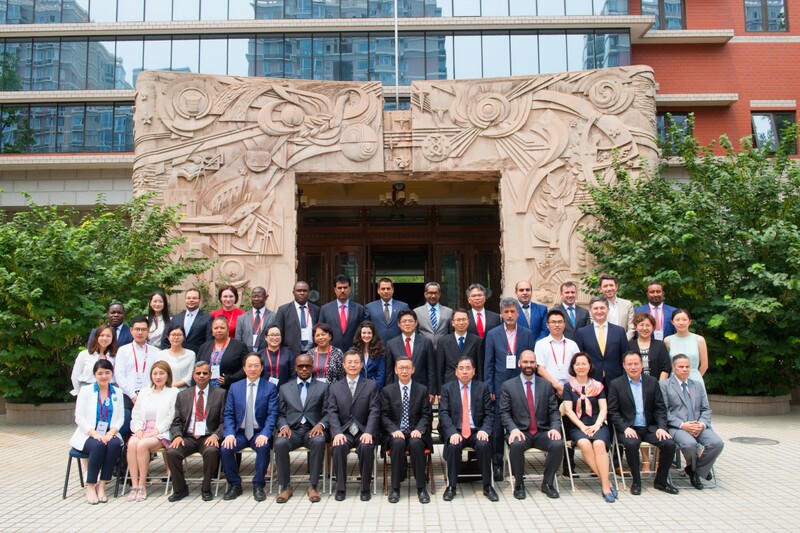 To deepen the practice of South-South Cooperation, during the tour to the Export-Import Bank of China, Mr. Xia Jianhua, General Manager of Human Resources Department, and Mr. Feng Wangfei, Vice General Manager of Strategic Planning Department, received the program participants in meticulous and thoughtful arrangement. Particularly, the Bank assigned different discussion groups according to the geographical distribution of the participants, headed by Manager Peng Hao from Corporate Business Department, Manager Li Dan and Zhang Chenxu from Concessional Loan Department, and Manager Liu Qian from Transport Financing Department. They had a thorough discussion on issues like the estimated time of concessional loan, loan conditions and those social projects supported by loan business. All the participants were amazed at the meaningful exchange. In this regard, Dr. Wu Zhong, the Director-General of FCSSC and SSEF, and Mr. Xu Junhua, Chairman of Hongru Financial Education Foundation, both expressed their willingness to sponsor the “South-South Education Program for Economics and Finance” in the next few years to promote the cooperation between China and other South-South countries and build a better future. In addition, the program participants also went on a study tour to one of the leading industry city operators in China, the China Fortune Land Development Co., Ltd (CFLD). After an intensive discussion and field trip, participants were surprised by the comprehensive layout and sustainable development of Gu’an New Industry City. Dr. Ahmed Ramy Ismail Abdelfattah Fouda, Assistant Manager of the Central Bank of Egypt, were among those amazed at China’s rapid urbanization. “I’ve read a lot of information on China’s urban construction, but it’s still astonished to see it in person. I hope the new capital construction plan of Egypt can be like this.” On the other hand, according to Dr. Fouda, the main reason that China could quickly become the world’s second largest economy was the introduction of foreign capital and appropriate monetary policy to stimulate exports. “This should be the main direction of Egypt’s efforts.” During the CFLD visit, Prof. Ju Jiandong from PBCSF taught a very thoughtful class regarding the “new normal” of international trade, the new pattern of global economic governance G3 and China’s new policy of trade openness. The last stop was Bank of China (BoC). Mr. Zhang Qingsong, Vice President of BoC, leaded several members of the General Manager’s office including Human Resources Department, Corporate Banking Department and Financial Institutions Department, to hold a symposium with program participants on BoC’s history and Q&A in terms of BoC’s overseas business plan and risk assessment. Mr. Vadym Kryzhanivs'ky, Director of a private equity in Ukraine, asked Mr. Zhang if BoC was ready to compete with those investment banks in the west. “BoC has entered the western market long ago, and now thanks to the popularity of “Belt-and-Road”, BoC has a huge potential not only to serve Chinese enterprises’ going out, but also to serve the local people,” Mr. Zhang responded. 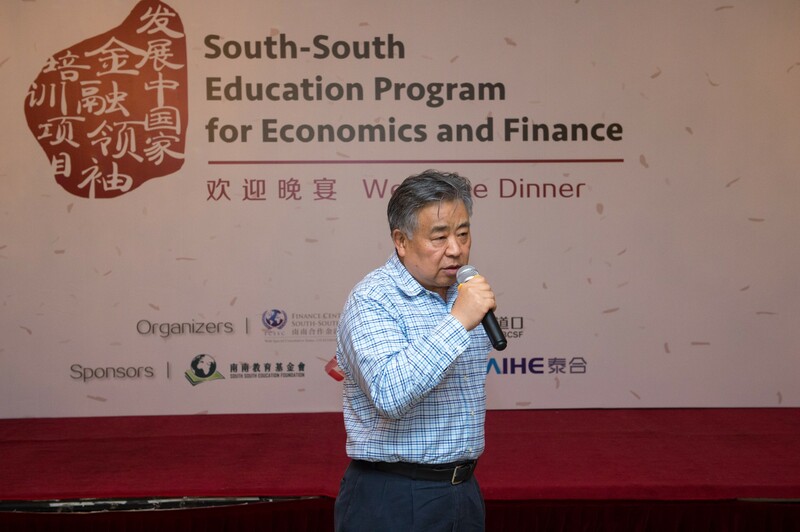 In the Welcome Dinner, Mr. Zhang Zhiping, who is the Executive President of FCSSC, Vice President of SSEF and Executive Vice Chairman of Hongru Financial Education Foundation as well, mentioned that “all the participants are financial leaders and managers from their home countries, and they bring their own experience to China on this trip. 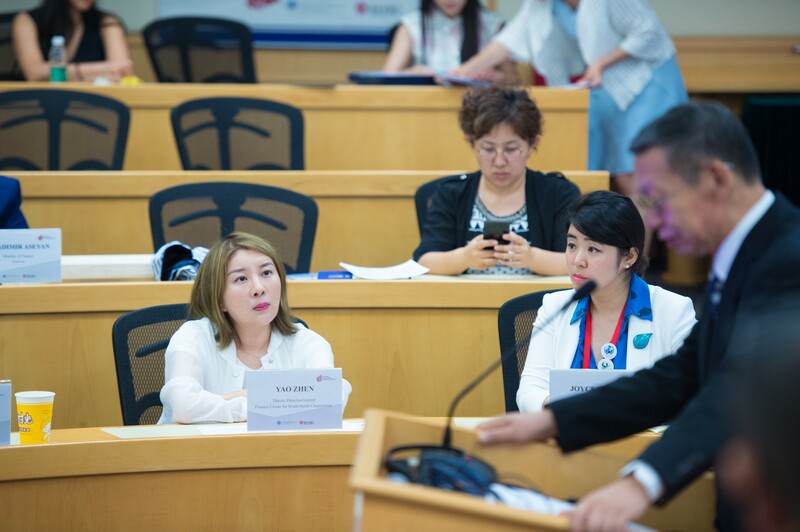 We hope this training program can help the participants to become the backbone of the development of their own financial industry.” Madam Li Xiulan, Secretary-General of Hongru Financial Education Foundation, added that as a main sponsor of the program, Hongru would like to take this opportunity for the institution’s’ internationalization and make contribution to train the financial leaders and talents from South-South countries. 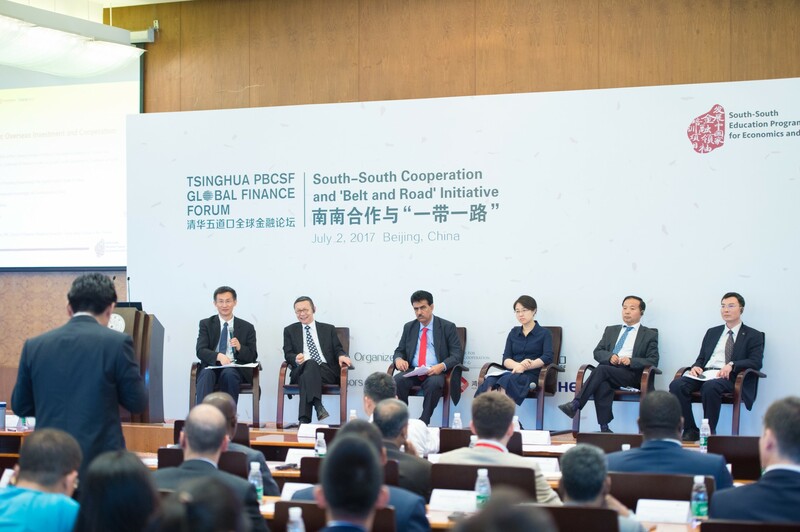 Near the end of the program, to better promote the exchange of ideas and expand the influence of South-South cooperation , the FCSSC and PBCSF specially organized a forum named “Tsinghua PBCSF Global Finance Forum—South-South Cooperation and ‘Belt-and-Road’ Initiative”, which invited Mr. Zhou Hao (Tsinghua PBCSF Associate Dean), Mr. Cai E’sheng (Chairman of FCSSC and SSEF, and former Vice Chairman of China Banking Regulatory Commission), and Mr. Zhou Yanli (Special Researcher in the State Council and former Vice Chairman of China Insurance Regulatory Commission to attend the forum and deliver keynote speeches to share China’s development experience accumulated during reform and open-up. As a representative of the participants, Dr. Bhekuyise Nicholas Mfeka, Advisor to the President of South Africa, said that he had learnt a lot about policy and experience, at the meantime gained valuable friendship. He encouraged the participants to report to their countries’ leaderships to have more and more interactions with China soon and strengthen the implementation of national development projects. To further facilitate the communication, the round-table forum specially invited Chairman Cai from FCSSC, Mr. Feng Chunping (Head of the Strategic Planning Department of the Export-Import Bank of China), Ms. Jiang Xiheng (Deputy Director of China's Knowledge Center for International Development), Mr. Zong Liang (Chief Researcher of Bank of China) and Mr. Baboo Gulab (Mayor of Gwadar, Pakistan) as another representative of program participants. These guest speakers discussed various topics from the “Gwadar Port”, the “Belt-and-Road” Initiative, to foreign trade, which impressed the audience with a more profound understanding of South-South cooperation. The first batch of participants graduating from the “South-South Education Program of Economics and Finance” last year have gone back to their home countries and continued to play an important role in their work. As particularly mentioned by Chairman Cai, those participants have created their own WeChat group to stay in touch. Now, the second batch of participants also built their social network in WeChat and WhatsApp group to share feelings and exchange ideas anytime anywhere. “Every country can find its own way of development, and I hope the participants can help each other for common development after the one-week study and visits,” said Madam Wu as a wish to these financial leaders from different developing countries. When the program came to an end, the participants all said that their feelings matched perfectly with their expectations. Though they had to say goodbye to each other and China, their friendship would never end. Exchange and cooperation between countries from civil to official have just sailed from here.